Posted on Tue, Jan 29, 2013 : 5:59 a.m. The owners of Grizzly Peak are opening a German bar, called the Old German, in the basement of the downtown Ann Arbor brewpub. It has been 18 years since the Old German closed, but Jon Carlson still has fond memories of the long-time downtown Ann Arbor restaurant. “I would come in for lunch where there was a lunch counter, and you could sit alone and not feel uncomfortable. I would be here twice a week or three times a week,” he said. Carlson and one of his business partners, Chet Czaplicka, replaced the Old German at 120 W. Washington St. with Grizzly Peak Brewing Company in 1995. Years later, Carlson and his partners have plans to bring the Old German back to life — potato salad and all. Construction is under way on the vacant 2,000-square-foot basement below Grizzly Peak, which will be transformed into a German bar — called the Old German — with a limited food menu. The exterior of Grizzly Peak Brewing Company, located on West Washington Street in downtown Ann Arbor. 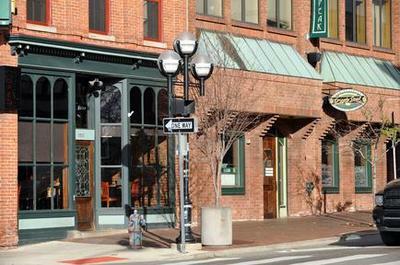 The Old German first opened downtown in 1928, according to an Ann Arbor Observer article from 1995. Bud’s father, Fritz Metzger, purchased the Old German in 1946 — years after his brother opened a similar German restaurant in downtown Ann Arbor called Metzger’s, which is now located on Zeeb Road. In 1975, a fire destroyed the Old German and it was rebuilt before closing in 1995. During the next few months, Carlson plans to double the brewing capacity at Grizzly Peak, and the lobby will be reconfigured so that the Old German has a direct entrance. He’s also bringing back a version of the Old German’s wrought iron sign. He hopes to open the bar in March or April. “It’s going to have heavy cedar timbers and a big, heavy bar with some of the craziest, funkiest lights from the 1960s from Eastern Europe and a jukebox,” he continued. Although the new concept draws inspiration from the original Old German, Carlson wants customers to know it won’t be exactly the same. 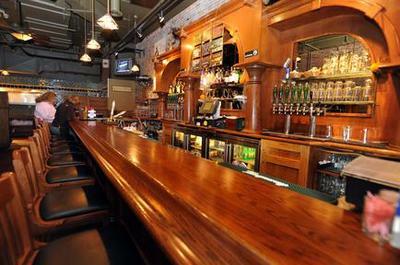 One of the bar areas at Grizzly Peak in downtown Ann Arbor. Carlson hopes to open a bar that Bud, who died years ago, would be proud of and support. “I think he’d like to know that something he worked so hard on still means a lot to Ann Arborites and is coming back in a different form,” he said. The basement bar is a model Carlson and his partners know well: they launched two basement concepts in 2012, with the opening of mash below Blue Tractor and the new Cafe Habana underneath Lena. Carlson and his business partner at 2mission, Greg Lobdell, together own a dozen restaurants around the state. The duo often works behind the scenes and they hire a partner to handle day-to-day operations at the restaurants. Although Carlson said they’re “slowing down,” there are several projects in the lineup, including a possible rooftop concept at Lena, a possible Jolly Pumpkin in downtown Royal Oak and the recent opening of a new Jolly Pumpkin brewing facility in Dexter. “I don’t think we’re done, but I think we’re definitely taking a kick back to focus on what we have. Of course, I’ll say that and then something will come up,” he joked. See also: For more information on the Old German, check out this 1995 article from the Ann Arbor Observer. There are some copies of an Old German cookbook collection, made by a former server and the chef, available on Amazon. Thu, Jan 31, 2013 : 12:52 a.m.
Wouldn't it be great if the old lunch counter could be reproduced, if not in wood, at least in spirit. Dad and I would eat at the counter from time to time before WII. I learned when asked to pay attention to the activity, that some patrons, didn't pay for the meal , but left what they could. Another life lesson learned, never forgotten. It was a never ending hustle behind the horse shoe counter, serving hot plates of food and a constant patter, by the white wasted guy behind the counter. The steps were rather high from the Ashley street street entrance, but I knew it was well worth the effort. Wed, Jan 30, 2013 : 3:38 p.m.
Tue, Jan 29, 2013 : 11:32 p.m. The headline &quot;Grizzly Peak owners plan to revive the Old German in restaurant's basement&quot; begs the question, will they use CPR or had he been frozen for preservation? Tue, Jan 29, 2013 : 9:25 p.m.
Tue, Jan 29, 2013 : 8:16 p.m.
Tillsen I have the Rathskeller on John R in Detroit , still goo and going strong..
Tue, Jan 29, 2013 : 7:43 p.m. I've always been a big fan of both restaurants. I only hope that Grizzly Peak replaces the back stairway to the basement toilets to make it safe for customers. It's way too steep and dangerous right now, and lacks a handrail you can hold onto. Tue, Jan 29, 2013 : 6:08 p.m.
Tue, Jan 29, 2013 : 4:32 p.m.
My daughter surprised me for my birthday with a copy of the recipe book available on Amazon. How nice to be able to make that delicious potato salad myself. Tue, Jan 29, 2013 : 4:15 p.m. Okay, Spätzle or Spatzen? Supposedly it depends on what area of Germany the family is from. We are a spatzen family from the Stuttgart area coming to Ann Arbor around 1848.How about you? Wed, Jan 30, 2013 : 12:36 a.m.
@Michisbest My entire family calls them kniffles too! Tue, Jan 29, 2013 : 5:59 p.m. If you're from the Stuttgart area, you could be calling it either. Spätzle, as that is the Schwabish (a German Dialect) word for the noodles. And Stuttgart is on the cusp of &quot;Schwabia&quot;. I used to live in Heilbronn (which is just north of Stuttgart) and residents generally called it Spätzle (all the menus list it as such). Most preferred to think of themselves as &quot;Schwabish&quot; although technically they no longer are. Tue, Jan 29, 2013 : 5:52 p.m. Okay I'm only a quarter German but we called it kniffle? Tue, Jan 29, 2013 : 4:37 p.m.
Tue, Jan 29, 2013 : 4:31 p.m.
My parents and grandparents always called it Spatzen. Tue, Jan 29, 2013 : 4:23 p.m.
Tue, Jan 29, 2013 : 3:58 p.m.
Entlich! Gute Nachrichten! Kann kaum warten bis zum eröffnung! Thu, Jan 31, 2013 : 3:37 p.m. Finally, Good News. Can't (can hardly) wait for it to open. Wed, Jan 30, 2013 : 8:06 p.m.
Tue, Jan 29, 2013 : 8:12 p.m.
Tue, Jan 29, 2013 : 5:43 p.m.
Tue, Jan 29, 2013 : 3:47 p.m. If they can equal the food of the former Danube Inn of Milan, then they will have something. I am otherwise unimpressed with A2 &quot;german&quot; food, including Old German. Tue, Jan 29, 2013 : 11:36 p.m.
Nicholas: Your history is wrong on the Old German. Didn't fail, just ended. Same can be said for the Parthenon. Tue, Jan 29, 2013 : 10:16 p.m. I stand by my comment. Metzgers and Old German both failed as restaurants in Ann Arbor. That part is fact. That their food was meh is my opinion. If their food was better, perhaps they could have made it. Tue, Jan 29, 2013 : 9:28 p.m. I voted your comment down 'cause I loved both Metzger's and the Old German, but the Danube in was really marvelous! My parents and I used to drive down to Milan just to go there. Tue, Jan 29, 2013 : 6:31 p.m.
Metzger's has good food. Not sure what you're looking for but they slap on a damn decent futtersack. Tue, Jan 29, 2013 : 4:07 p.m.
Tue, Jan 29, 2013 : 3:41 p.m. Exciting. I hope that they're planning to revive the original Old German recipes. The Old German in name only would be disappointing. Tue, Jan 29, 2013 : 9:37 p.m.
Don't get your hopes up. The resurrection of Metzger's on Zeeb brought back the old furniture, but a pale imitation of the food. It's too many generations past the founders. Tue, Jan 29, 2013 : 3:35 p.m.
Ich hatte zu benutzen google translate, die deutschen Kommentare zu lesen. Thu, Jan 31, 2013 : 3:36 p.m.
not sure if you're being sarcastic or not, but translated, he is saying he had to use google tranlsate to read the comments made in German. Tue, Jan 29, 2013 : 2:45 p.m.
Mon, Feb 4, 2013 : 11:40 a.m.
How can I get in touch with you to buy a few copies? Fri, Feb 1, 2013 : 4:26 p.m.
We sell the books for $15. I can even have them autographed. Wed, Jan 30, 2013 : 8:24 a.m.
How cheap are your prices? Seems pretty expensive on amazon. Tue, Jan 29, 2013 : 2:19 p.m.
OK, as someone who wasn't in Ann Arbor when the Old German was open, I want to hear some memories! What was it like? 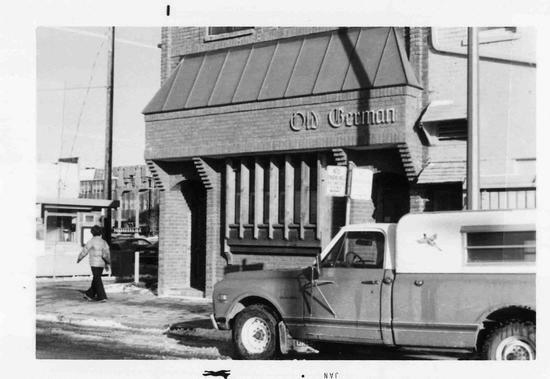 Wed, Jan 30, 2013 : 8:02 p.m.
My Grandfather worked at the Old German for decades. I remember when the fire broke out our whole family went down to watch, it was the first and only time I remember seeing my Grandfather cry. Being the grandson of german immigrants anytime I smell german food it brings me back to holidays at my grandparents house. Love the food, purple cabage, rouladen, sauerbraten, the cucumber salad. Miss the place for sure! Tue, Jan 29, 2013 : 3:59 p.m.
My family and we spent many a Sunday afternoon eating at the Old German (with old germans). Man, good memories. I remember the Old German from my childhood, and what really stood out was the incredible wall-to-wall collection of beer steins. They were fun to look at, and I used to beg my parents to take me there. The sheer number of them was phenomenal. It was a very sad day when a fire broke out and many of them were lost (late 70's, I believe). Foodwise, I don't remember much, but that is where I developed a liking for spatzen and red cabbage. Tue, Jan 29, 2013 : 2:30 p.m.
For a German restaurant, the food and the atmosphere was the real deal. Metzgers was always Number 2. Tue, Jan 29, 2013 : 2:05 p.m.
Love the Old German. Really miss it. We used to get take out from there when I worked at Goodyears on Main Street. Tue, Jan 29, 2013 : 1:53 p.m.
Oh...their sauerbraten! If only they could bring that back. Tue, Jan 29, 2013 : 2:01 p.m.
Forgot about that one, that was a great dish! Tue, Jan 29, 2013 : 1:36 p.m. The old photo at the top appears to be highly altered. The Old Town Bar and Ashley street have been cut out of the picture and the toll booth moved much closer. Maybe a political statement? Tue, Jan 29, 2013 : 4:55 p.m. I'm not wrong. Old town is on liberty. Grizzly Peak is on Washington. Tue, Jan 29, 2013 : 3:32 p.m.
You're both wrong. The Old Town is on Liberty and Ashley. The old pic of the Old German at the top of the story is of the Ashley St entrance. You can go out that entrance from inside the Grizzly Peak. The Old German /Grizzly Peak wraps around the former Del Rio bar which is now the Grizzly Den. Tue, Jan 29, 2013 : 1:58 p.m.
Ah! OK, now I remember that the Old German wraped around the Old Town and the entrance shown in the old photo above was the side or back entrance on Ashley street. Tue, Jan 29, 2013 : 1:42 p.m.
You got your streets mixed up. Tue, Jan 29, 2013 : 1:15 p.m. Wed, Jan 30, 2013 : 3:29 a.m.
Tue, Jan 29, 2013 : 4:08 p.m.
Tue, Jan 29, 2013 : 2:32 p.m.
Tue, Jan 29, 2013 : 12:32 p.m. Awesome. I used to go there with my dad when I was a kid. I can't wait to take my family there and make new memories of such a great old place. Tue, Jan 29, 2013 : 12:11 p.m.
And let's not forget that Bud Metzger's daughter, Crystal keeps the Metzger legacy alive as the owner of Lexi's Toy Box on Ashley St.--one of my favorite shops in Ann Arbor. Tue, Jan 29, 2013 : 1:11 p.m. Yes, great point! Thanks for posting. Tue, Jan 29, 2013 : 12:10 p.m.
Das ist sehr gut. Prost! Tue, Jan 29, 2013 : 12:01 p.m.
Ausgezeichnet! As a fan of the Old German, and as an owner of the cookbook Lizzy mentioned, this is great news. I vote that they bring back the bread, salad, beef rouladen and schnitzel. On the other hand, maybe incorporating some traditional German pub fare would be great too. Well, it doesn't really matter because I plan on living at this place more than Norm lived at Cheers. Tue, Jan 29, 2013 : 11:33 p.m.
M: There is a link at the end of the article and Tom Leib, whose mother wrote it, gives another link to it in the comments below. Tue, Jan 29, 2013 : 5:04 p.m.
Do you have a name for this cookbook? Is it still available today? Tue, Jan 29, 2013 : 2:10 p.m.
That would be two votes for the beef rouladen. Tue, Jan 29, 2013 : 11:20 a.m.
Tue, Jan 29, 2013 : 12:58 p.m.
That wasn't negative. Sarcastic, maybe. Not negative. Tue, Jan 29, 2013 : 11:37 a.m. They're just reminding us that they're smarter than all of us. That's all. Tue, Jan 29, 2013 : 11:25 a.m. I never get why people comment just for the sake of being negative. Tue, Jan 29, 2013 : 11:10 a.m. Wed, Jan 30, 2013 : 9:55 a.m. I suppose you could add sugar to the recipe, but I don't remember it having any. That's more like a traditional German potato salad. The Old German potato salad can still be found - they serve it at Metzgers on Zeeb and also they sell it at the party store at the fork where Dexter/Jackson split. I collect old Ann Arbor cookbooks because people ask me for Ann Arbor recipes all the time on my blog, and I like to help them out, and I have never seen the recipe published anywhere except in the recipe book self published by the former waitress which I got out of the library. As I said in my post, I improved upon the recipe by making it simpler and adjusting the amount of vinegar added. Here's an old newspaper clipping of Metzgers potato salad. It is similar but uses beef stock http://www.grandmas-recipes.com/Site/German%20Potato%20Salad.html If you know of any other cookbook that has the recipe, let me know the title. I'd love to add it to my collection! Tue, Jan 29, 2013 : 2:54 p.m. Thanks for posting, going to try this recipe! Tue, Jan 29, 2013 : 1:31 p.m.
Ma'am....with all due respect....their recipe wasn't a secret. It has been published in multiple recipe books from the city. I have two separate books myself with the recipe in it. I can also tell you that recipe isn't correct because the original recipe has sugar in it...yes sugar. Tue, Jan 29, 2013 : 11:26 a.m.